It’s the time of the year where everyone seems to be putting together lists. As a librarian, my very favorite kind of list is a list of recommended books. This, my friends, is how we discover what to read next! Also, if you celebrate a gift-giving holiday around this time, this is how you discover what to put on your wishlist and/or buy for everyone you know. But you know what’s even better than one list of books? You’ve got it–a list of book lists! A meta book list, if you like. 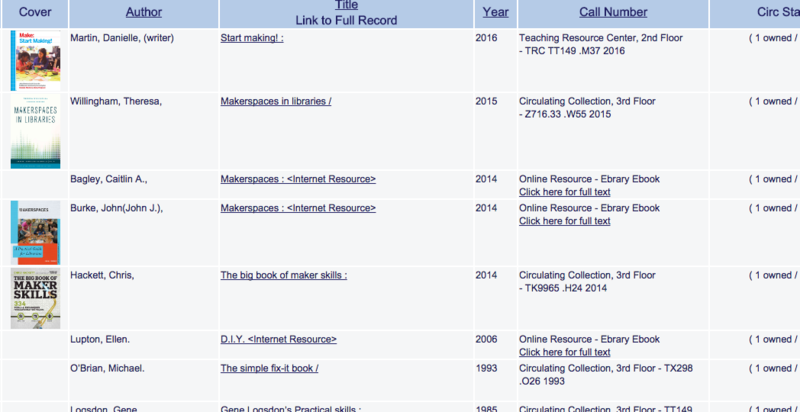 So here we go–lists of maker-related reading. If you know of a list that I miss, add it in the comments or tweet @makerbridge so that everyone can take advantage! Scroll down or control+f to the “Maker Books to Read” section. This one is broken down into topics, which is great. Lists include Electronics, Maker Culture, Books for Mini Makers, and more. The whole post is interesting, but for books you’ll want to scroll or control+f for “Maker Collection Booklist”. Scroll down a bit to see this list of books (including some fiction!) which is targeted at kids. Richland Library’s What Is A Makerspace? A nice list of makerspace titles. Just woodworking here, as you may have suspected from the title. Just weaving, but who doesn’t love weaving? Just cooking, as the title suggests. From the MakerBridge archives for your reading pleasure! So let’s hear it–what great lists have I missed?